James D. Pfeiffer - Howard B. Tate & SonFuneral Home, Inc.
Raymertown- James “Donald” Pfeiffer, 65, a longtime resident of Raymertown, died peacefully, with his beloved wife and devoted family by his side, Tuesday, May 3, 2016 at Samaritan Hospital in Troy following a short illness. Born in Troy, August 17, 1950, Donald was the son of the late James O. and Barbara E. (Waldron) Pfeiffer and for over 13 years the husband of Bonnie Pfeiffer of Raymertown who survives. 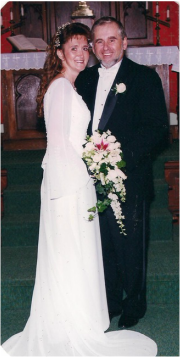 Don and Bonnie were married on October 12, 2002. Don was a graduate of Tamarac High School. For over 25 years he was employed by the Rensselaer County Highway Department, working at the Cropseyville substation, initially as a driver and later as a crew foreman. He retired in September 2011. Don also assisted his late father in the operations of the family farm, where he developed a great love for the outdoors and an easy country living way about himself. Don loved to tinker in the machine shed on the farm, operating “John Deere” tractors and especially enjoyed attending auctions looking for the next “toy” to add to his collection. Don was a member of the Raymertown Lutheran Church, a former fireman with the Raymertown Volunteer Fire Company and a past commissioner of the Raymertown Fire District. A funeral service will be held on Tuesday, May 10, 2016 AT 10:00 A.M. at the Howard B. Tate & Son Funeral Home Inc., 2237 NY Route 7, located in Raymertown. Burial will follow in Blooming Grove Cemetery in Defreestville. Relatives and friends are invited to call at the funeral home on Monday, May 9th from 3:00-7:00 P.M.
​At the request of the family, memorial contributions rather than flowers may be sent to the D.C. Rubin Dialysis Center, 1850 Peoples Avenue, Troy, New York 12180 in memory of James “Donald” Pfeiffer.